Classic example of a pit and pillar feature from Endeavour Ridge. The great majority of the Earth’s volcanism occurs at spreading centers, most of which are under the ocean, forming the mid-ocean ridge system where new ocean crust is being created. The Earth’s tectonic plates are slowly moving apart, and magma rises up to fill the gap, adding to the deep crust as sheeted dikes and sometimes flowing onto the seafloor as volcanic eruptions. 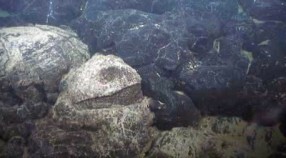 The shallow magma provides a heat source that causes intense circulation of water within the shallow oceanic crust and the venting of the heated, mineral-laden water at the seafloor. 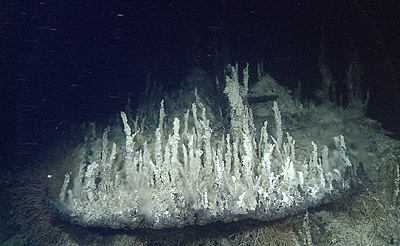 These hot springs and spectacular hydrothermal vents transport heat and chemicals into the ocean and provide substrate for chemosynthetic biological communities. The Gorda, Juan de Fuca and Endeavour Ridges have slow (~25 mm/yr) to moderate spreading rates, and are located off Oregon and Washington states and British Columbia. The Alarcon Rise in the Gulf of California and Northern East Pacific Rise have moderate to fast spreading rates. Segments of the Southern East Pacific Rise have super-fast spreading rates (>140 mm/yr), the fastest of which are southwest of Easter Island in the South Pacific. A major focus of our work has been at Axial Seamount, which is a hot spot interacting with the Juan de Fuca Ridge and where eruptions occurred in 1998, 2011 and 2015. We have mapped with our AUV at high resolution the summit caldera, upper flanks, and a large portion of the south rift zone, and extensively sampled with the ROVs lavas and sediments to obtain a record of the eruptive and explosive history of the volcano. Our papers on Axial Seamount are profiled in this Mid-ocean ridge section’s Volcanic Processes, Magmatic Processes, and Explosive Eruptions pages. Our research expeditions are profiled in our cruise logs. Note that off-axis, near-ridge seamounts are discussed in the Seamounts section of this website. Behind the trench and volcanic arc of a subduction zone, the lithosphere may stretch and extend and volcanic spreading centers may develop. Such a back arc setting is found in the Lau Basin, behind the Tonga Trench in the South Pacific. 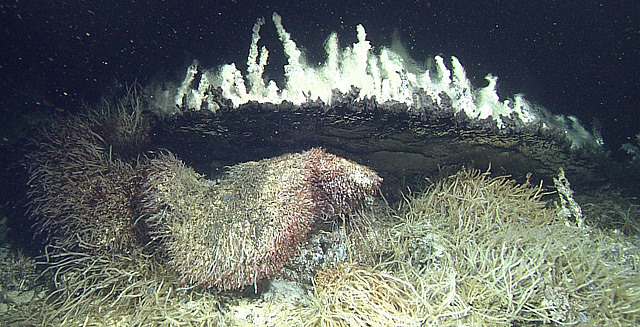 Hydrothermal vents are important for many reasons, including global fluxes of elements, deposits of economically-valuable minerals, and diverse assemblages of previously unknown animals and bacteria that are supported by the chemically-rich waters emanating from the vents. 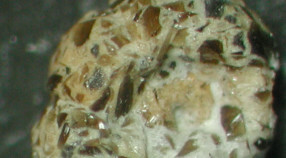 The volcanic eruptions at mid-ocean ridges have been thought only to be quietly effusive, but because we find glassy fragments of lava bubbles (limu o Pele) at mid-ocean ridges, there must be gas-rich mildly explosive eruptions at mid-ocean ridges as well. 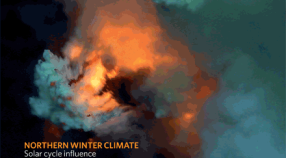 MBARI mapped the 2011 eruption at Axial Volcano with our AUV. Surprises included how most of the fissures had been pre-existing, and were reused (even widened and deepened) and fed lava into pre-existing channels. 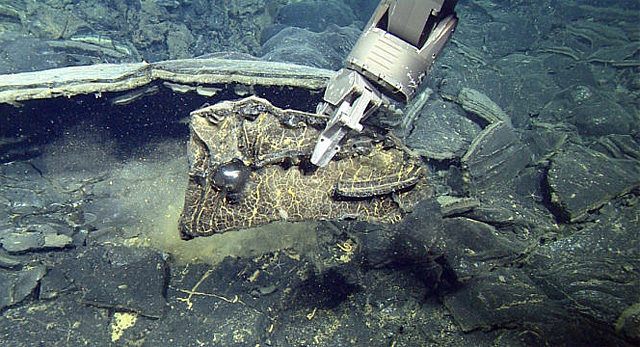 AUV maps allow us for the first time, to comprehensively map the thickness and extent of lava flows from a deep-ocean submarine eruption in high resolution. Jul 24, 2017 – Despite their close proximity, two recently discovered hydrothermal vent fields in the Gulf of California host very different animal communities. This finding contradicts a common scientific assumption that neighboring vents will share similar animal communities. Dec 15, 2016 - Axial Seamount, a large underwater volcano off of the Oregon coast, is one of the most active volcanoes in the world, having last erupted in 2015. 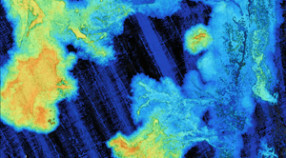 At the Fall 2016 meeting of the American Geophysical Union, MBARI researchers unveiled a new seafloor map that reveals previously undocumented lava flows from the 2015 eruption. 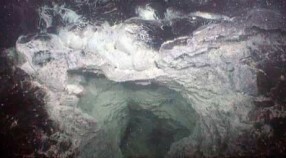 Jun 2, 2015 – In spring 2015, MBARI researchers discovered a large, previously unknown field of hydrothermal vents in the Gulf of California, about 150 kilometers (100 miles) east of La Paz, Mexico. Moore, James G., Clague, David A., Beeson, Melvin H., Smith, J. R., Anonymou, (1997). Observations of north submarine slope of East Molokai, Hawaii [Monograph] Geological Society of America, Cordilleran Section, 93rd annual meeting [modified]. : .